"Harima" redirects here. For the present town in Japan, see Harima, Hyōgo. 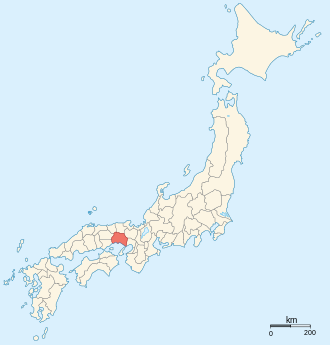 Harima Province (播磨国, Harima no kuni) or Banshū (播州) was a province of Japan in the part of Honshū that is the southwestern part of present-day Hyōgo Prefecture. Harima bordered on Tajima, Tanba, Settsu, Bizen, and Mimasaka Provinces. Its capital was Himeji. During the Edo period of Japanese history, the Akō Domain (fief) was part of Harima. The Forty-seven rōnin were samurai of Akō han. Ishikawajima-Harima Heavy Industries, a shipbuilder and major Boeing engine subcontractor gets its name from the province. Harima Province was established in 7th century. During the Meiji Restoration, Himeji Prefecture was established with the whole area of Harima Province as the territory. Himeji Prefecture was renamed to Shikama prefecture, and Shikama Prefecture was transferred to Hyōgo Prefecture finally. ^ Nussbaum, Louis-Frédéric. (2005). "Harima" in Japan Encyclopedia, p. 290, p. 290, at Google Books. ^ "Nationwide List of Ichinomiya," p. 3; retrieved 2012-11-20.